Coromandel Coast lined hat, from an auction. But in this instance, I wanted a lady’s hat, so I pleated up about two yards of green silk ribbon, and added a bow. To get the multi-vector bending effect, I stitched millinery wire from Abraham’s Lady around the brim. The inside of the brim is lined with pieced scraps of the purple “Fleurs d’Inde” I used for a jacket (also made from a Wm Booth remnant). It ties on with yet another yard or more of ribbon. This is really a frivolous hat, for me. 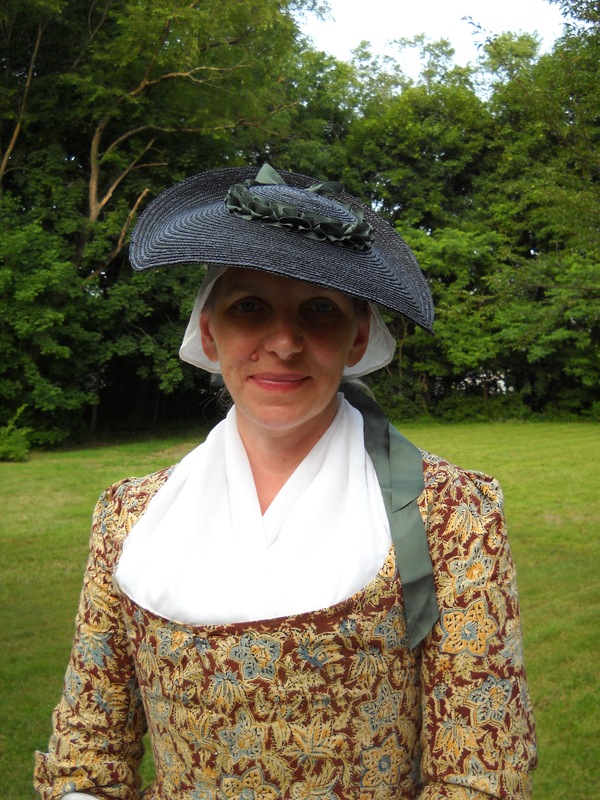 There are extant examples of straw hats lined with chintz, as you can see. As luck would have it, I got to wear it right off, the very day I made it. How often do you get the chance to do without panic and pain? We attended the Saturday version of the Rochambeau Tea on Joy Homestead, an event which has its dedicated fans. I wore this same gown last year, and to Nathan Hale; to my delight, I am enjoying it more each time I wear it. I think this petticoat is the right one; madder was too close and black too contrasty. 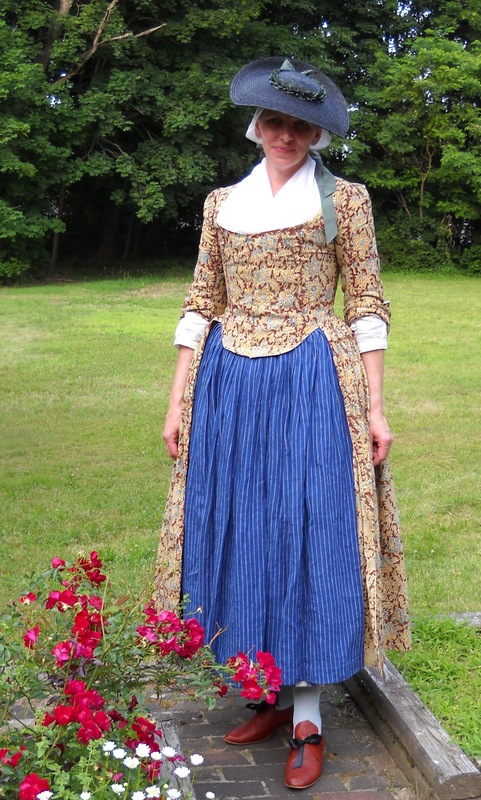 Since the Rochambeau Tea “year” is 1780, this dress passes (ahem) muster; for many of the events I attend, it is too fashion forward. This hat will, I think, also work for the 1763 event, as the woman in yellow here is wearing a similarly dual-plane twist hat. I’ll never have a yellow gown though: I look pretty horrid in yellow. Oooh, gorgeous hat! Could we see the lining? I am green with envy over your gown. The blue petticoat looks fantastic with it! I second the motion on the hat-lining. Lining on Friday! Thank you for the comment about the gown. It took a while to figure out what and how to wear it.